"The healthiest way to make fries is to bake them. It saves money and you can't beat the taste. I have been playing around with different ways to bake fries for some time now, and I feel this is the best recipe thus far. Baking time may vary depending on how thick you cut the fries. Enjoy!" Preheat oven to 425 degrees F (220 degrees C). Line a baking sheet with aluminum foil; spray with cooking spray. Place sliced potatoes in a colander; sprinkle sugar over potatoes. Set aside until liquid is released from potatoes, 20 to 30 minutes. Drain liquid and dry potatoes well. Mix potato slices, olive oil, garlic powder, salt, and black pepper in a resealable bag until evenly coated. Spread coated potato slices in a single layer, leaving space around each potato, on the prepared baking sheet. Bake in the preheated oven for 20 minutes; flip fries and continue baking until crisp and browned, about 20 more minutes. 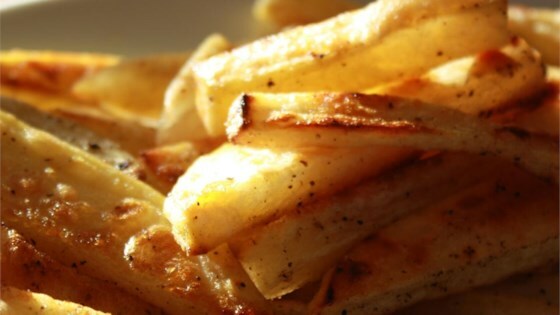 See the tasty way to make baked French fries. When I cut the potatoes I make 3 cuts lengthwise, so I'm left with 4 ovals. Then each oval is sliced into 3 strips. The sugar releases the juices in the potatoes and allows them to crisp more, so don't leave out the sugar.